We had a FABULOUS vacation in California. Yosemite and Sequoia were amazing, and we even saw 10 bears while hiking, including two babies climbing a tree. How cool is that! Now that we are back home in the icky Missouri heat and humidity, I'm trying to come up with meals that won't heat up the house to cook but will still be tasty and filling. Here is this week's menu. For more menu ideas go to orgjunkie.com. Have a great week! Today I hosted the teachers who are participating in my Mark Twain Award book club for a luncheon to discuss the first six books we read this summer. Each summer I invite my 3rd and 4th grade teachers to read all 12 of the award nominated books for the coming year, and we meet book club style to discuss them and share ideas of how to use them in the classroom. I have 9 teachers participating this summer, which is great! My son cut some flowers from my rose bush to use as a centerpiece on the table. I think it was simple, but very pretty. 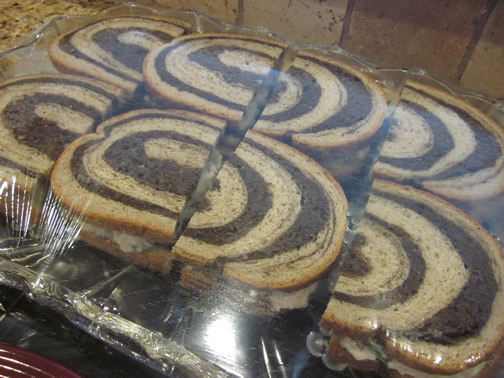 :) Here are a few pictures of the food. I forgot to take a picture when the girls arrived, but we had a great time! Preheat oven to 350°F. Roll pastry to 12-inch circle on lightly floured surface. Place in 9-inch pie plate. Turn under edge; flute. 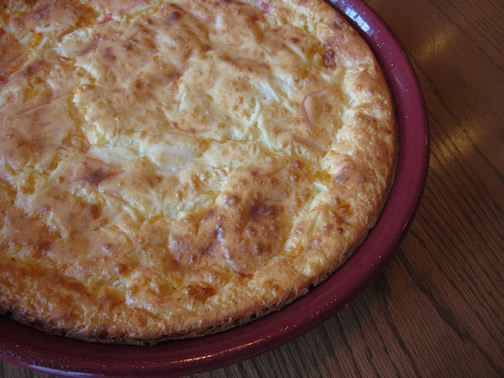 Toss cheese with flour in medium bowl. 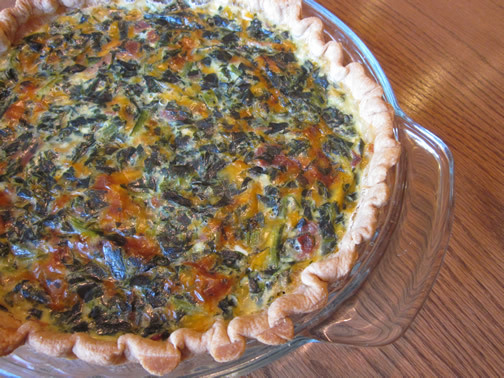 Add spinach, milk, eggs, bacon and seasonings; mix well. Pour into pastry shell. Lightly grease a 10-inch glass pie plate. In food processor, blend the first 8 ingredients. Pour the mixture into a large bowl and stir in the crab meat and monterey jack cheese. Pour mixture into the prepared pie plate and bake for 45 - 60 minutes until puffed and golden brown. 1. Place ribs in a shallow roasting pan. Season with rosemary, thyme, and pepper. Cover and bake at 325 degrees F for 1-1/4 hours or until a meat thermometer reads 160 degrees F.
2. Remove ribs from oven and baste with BBQ sauce. Grill ribs, uncovered, over medium heat for 10-12 minutes, basting with 1 cup sauce and turning occasionally. 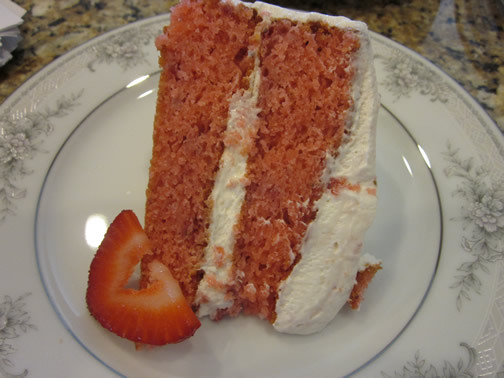 This recipe is similar to the three layer strawberry cake I've made before, but the frosting on this one is much better. Combine cake mix and dry gelatin mix in large bowl. Add eggs, oil, water and 3/4 cup strawberries; beat with mixer until well blended. Pour into 2 greased and floured 9-inch round pans. Bake 30 min. or until toothpick inserted in centers comes out clean. Cool cakes in pans 10 min. Remove from pans to wire racks; cool completely. Meanwhile, drain remaining strawberries. Beat cream cheese in large bowl with mixer until creamy. Gradually beat in sugar. 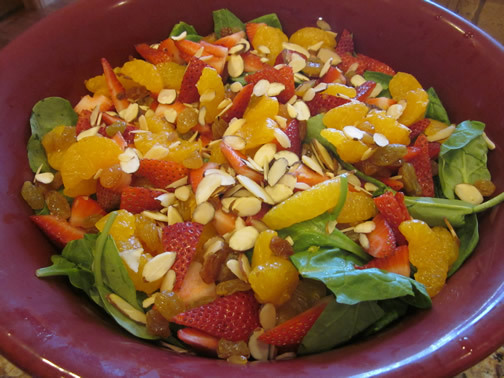 Add drained berries; mix well. Whisk in Cool Whip. Stack cake layers on plate, spreading 1 cup frosting mixture between layers. Frost top and side with remaining frosting mixture. Keep refrigerated. We are getting ready to go on vacation! Woo hoo! We are headed to California to go to Yosemite on Tuesday. Because of our travel, my menu this week and the next week will be a bit sparse. 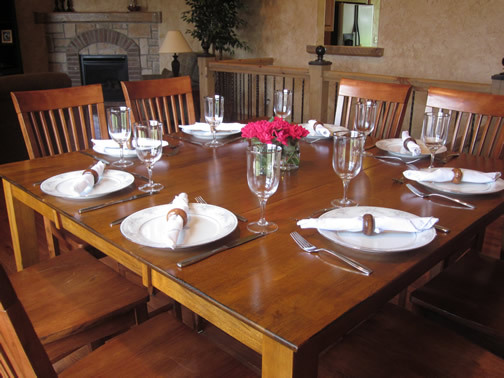 But, I'll link you to some previous year's menus during this month to give you some additional ideas. :) On a side note, the Marsala Burgers from last week were FABULOUS! Be sure to try them out if you're looking for a new burger recipe. Here's my menu for the next two weeks. We have a housesitter staying at our house while we're gone, but I'm sure you won't want his menu. :) Again, be sure to check the archives for more ideas. You can also find more menus at orgjunkie.com. Sorry this has been a little late in getting posted, but Blogger was down all morning for some reason unknown to me. We are starting our second week off from school and have really enjoyed having some extra time together as a family. 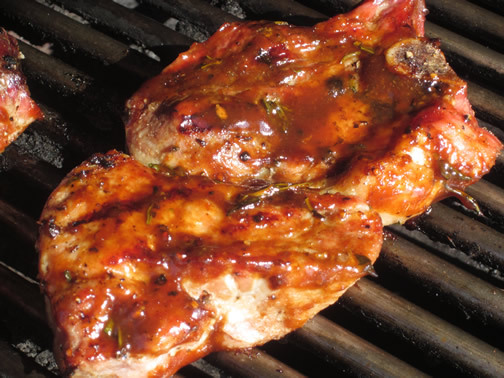 You'll see quite a few grilling recipes this week as we tend to grill a lot in the summer. I've also got a few new items on the menu this week, so as soon as I make those items, I will add the photos to the recipes. Here's this week's menu. For more menu ideas, go to orgjunkie.com. Have a great week, and enjoy! 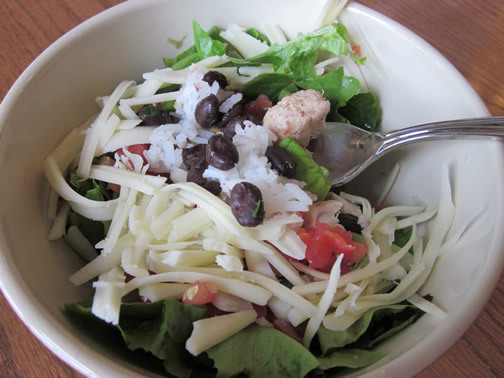 *To make Burrito Bowls, just put some rice in a bowl (you can flavor it with salsa or taco seasoning to make Mexican rice if you wish - I just like to add some cilantro to regular white rice), add some black beans, grilled chicken or grilled beef strips (like you would have for fajitas - I keep cooked grilled chicken in my freezer for recipes like this), salsa or pico, lettuce, cheese and any other burrito type toppings you like. It's like eating a burrito without the tortilla. 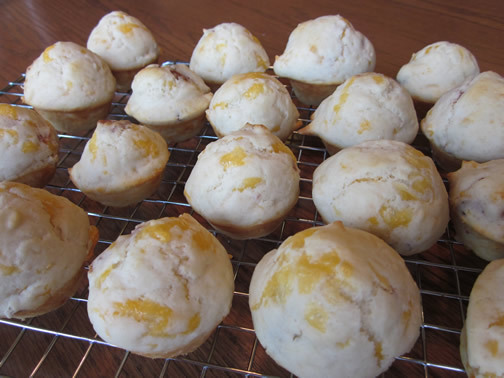 These are similar to another cheesy bacon muffin I make, but these are mini muffins and have garlic in them. They are very tasty and make a great breakfast or snack. Preheat oven to 400 . Spray mini muffin pans or use paper liners. Mix all ingredients together and fill cups almost full. Bake 15 minutes. Place eggs in a large wide saucepan and cover with cold water. Bring to a boil for 12 minutes. Drain water and fill pot with cold water to cool eggs. 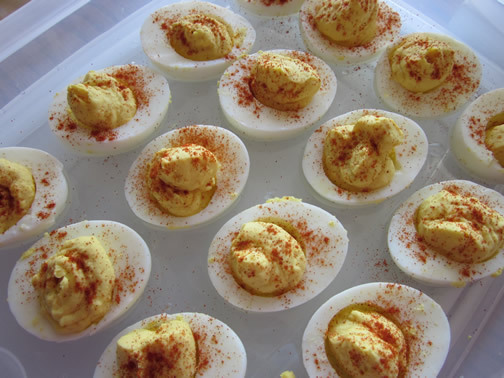 Once eggs are cool, remove shells from eggs and slice in half lengthwise. Separate egg yolks and place into a bowl. Place whites on a separate plate. Add mayo and mustard to yolks and mash together with a fork until creamy and smooth. Place egg mixture in a resealable plastic bag, cut the corner of the bag, and pipe the yolk mixture back into each egg, enough to fill yolk holes completely. Dust tops with paprika. Refrigerate. Serve cold. These are spectacular tasting burgers. 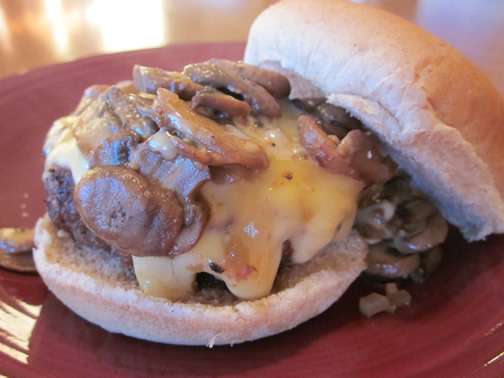 The combination of the mushrooms in the wine sauce and the smoked gouda make these a burger worth making. French baguette or crusty rolls, for serving (I just used regular wheat hamburger buns because that's what I had on hand). Lightly mix together the ground sirloin and Worcestershire. Form the mixture into four patties. Season on both sides with garlic powder and fresh pepper. Heat grill to medium heat (can also fry in a pan if you don't want to grill them). Cook the burgers until they are just undercooked to your liking (so if you like your burgers medium, cook until medium rare). Remove from the grill and set aside. In a large skillet, add the butter, the shallot, garlic, and mushrooms. Saute until tender and the mushrooms have lost all their juices. Increase the heat to medium-high and add the marsala. Scrape up any browned bits from the pan and reduce the liquid by half. Add the broth and reduce again by half. Season to taste with salt and pepper. Add the burgers into the pan and continue cooking another minute or so. Top with the cheese and melt (cover with a lid if you have one to make this easier). Serve the burgers on the baguette/rolls and top with the mushroom mixture. 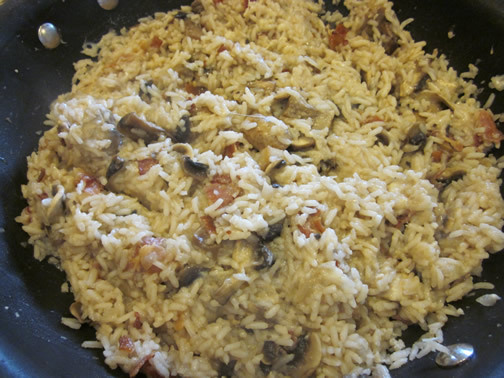 This was a tasty rice dish, but not a favorite of the boys (too many mushrooms for them). 1 lb bacon, cook crisp and break into small pieces. Cook 4 cups rice with 4 teaspoons chicken bouillon added to the water (usually means two cups uncooked rice and 4 cups of water). Heat a large skillet to medium heat. Add oil, onion and garlic. Cook about 6 minutes or until the onions are tender. Stir in mushrooms and cook 5-8 minutes until mushrooms are tender. Stir in rice, 1 cup chicken broth, salt and pepper. Cook until heated through. Remove from heat and add cheese and bacon. Stir to combine. 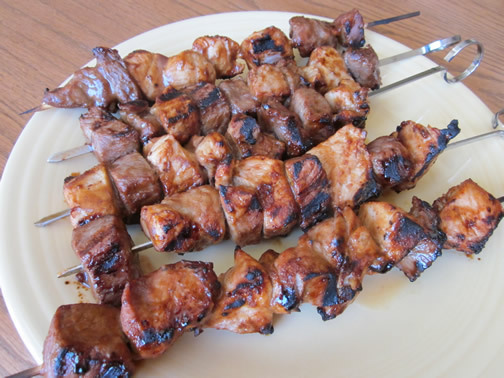 These are really simple, really tasty kabobs that just use pantry ingredients for the marinade. It's a great way to use up small portions of meat you might have in the freezer. Grill 6 minutes or until meat is done, turning after 3 minutes.